There are many different kinds of recipes for shredded beef, and one is different from the other depending on the country. Here in the US, we make it rather simple. It is made with several ingredients to give it flavor while it cooks or it is seasoned with different spices, but for the most part, it is simply shredded and served on its own. In Mexico, it is often cooked with orange or lime juice, or both, and of course, it is usually made a bit spicy. In Colombia, we add onion and garlic to the pot where we cook the beef so we can add more flavor while it cooks. We then shred it and mix it with the hogao or seasoning, which we make separately. That’s when I usually stop and pick out the chunks of onion of my own serving because like I told you before, I’m not a big fan of onions. My mom, the sweet woman that she is, used to take them out herself from my plate, or she would blend the hogao to make it into a tomato sauce. 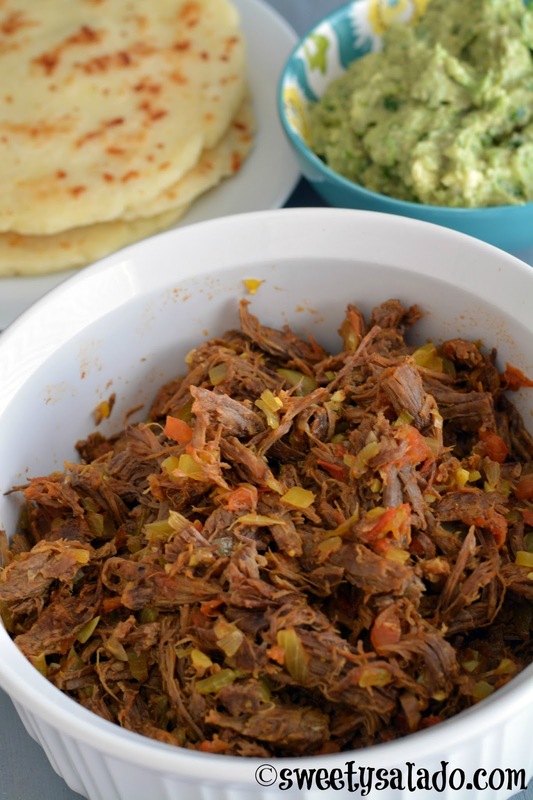 You can serve the shredded beef with rice as a main dish, but in Colombia is very common to serve it on top of arepas or patacones (fried green plantain chips). And if you need both recipes, here are the links: arepas and patacones. 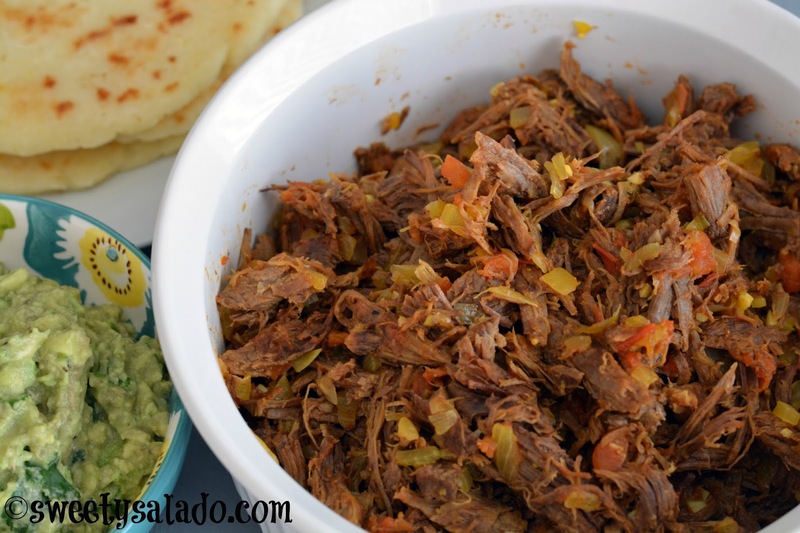 Place all of the ingredients for the beef in a pressure cooker or large pot. Pressure cooker: Cover the pressure cooker and bring it to pressure on high heat. Reduce the heat to medium low and cook for 1½ hour. Regular pot: Cover the pot and bring it to a boil on high heat. Reduce the heat to medium low and cook for 2½-3 hours, or until the beef is fully cooked and tender. Let out the pressure from the pressure cooker, carefully uncover it, take out the beef and shred it with two forks or with your hands. Reserve the beef stock and set it aside. To make the hogao, heat the olive oil in a large pan on medium heat. Add the chopped white onion and cook for 2-3 minutes or until it's translucent. Then, add the green onion and garlic and cook for 1-2 more minutes. Now, add the chopped tomato and cook for 5-8 minutes or until it's softened. Season with the ground cumin and food coloring. Add the shredded beef and mix until it is completely covered with the hogao. If you see that it is too dry, you can add some of the beef stock that was reserved previously. Check for seasoning and add salt and pepper to taste. Serve alone or with arepas or patacones. Yum! Is the tomato paste optional, or does it make a big difference in taste?